Twist up this solid, creamy stick of effective skin moisturizers. The velvety balm applies smoothly and leaves skin silky. It is loaded with antioxidants and safe for all ages, even babies. 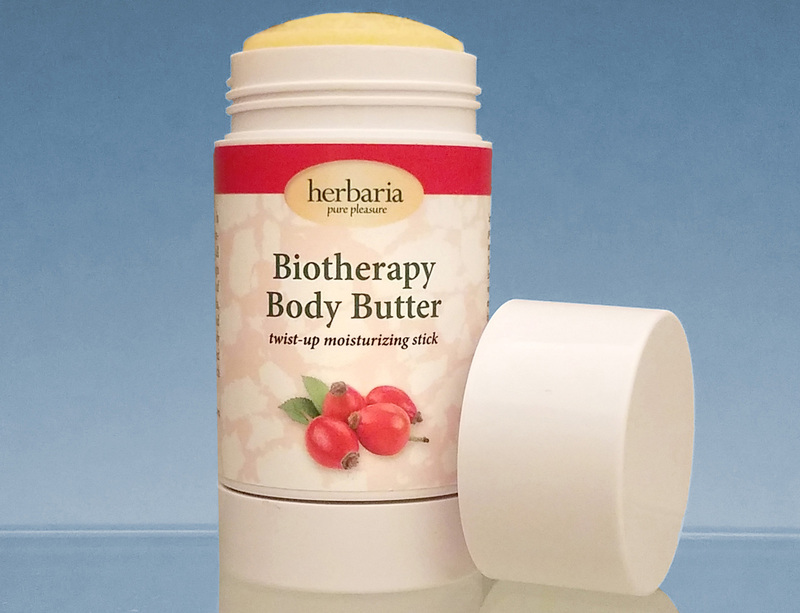 Biotherapy™ Body Butter smells pleasantly nutty and sweet. Mango butter and cocoa butter plus oils of almond, coconut, avocado, and rosehips soften and hydrate skin. Biotherapy Body Butter soothes sun damage and helps prevent stretch marks during pregnancy. The stick melts at body temperature and can melt in a hot car or your luggage. It will resolidify and may become slightly grainy, but will still be useful. Rosehip oil has an anti-aging reputation for firmer, smoother, more youthful skin. Note: Since this product can melt at around 100 degrees, it may melt in shipment in hotter regions. However, the tube won’t leak in transit. The body butter will still be terrific for your skin. If you like Biotherapy Body Butter, try our Biotherapy™ Beauty Collection.